It seems that each fall, we return to our favorite fall books. There are so many wonderful authors who have written classic children's books about fall. These books have become as comforting as a bowl of hot chili on a cool fall night. Here's a look at our must-read fall books. We also have a lot of fun in the fall doing fall activities and fall crafts. 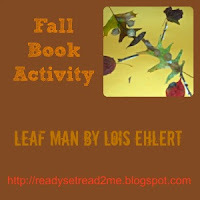 One of my favorite books to use in the fall is Leaf Man by Lois Ehlert. After reading about a man made out of leaves, you'll have to venture outside and create your own leaf man. This is a great way to preserve all of the fall treasures your little ones bring inside. We also enjoy apple theme activities and farm theme activities in the fall. Here are some of our favorite picks for apple books for preschoolers. Here are a few Apple activities and poems we enjoy as well. This year we took our annual trip to the farm to pick our apples. Our don't-miss-it, favorite-farm-book pick is Farmyard Beat by Lindsay Craig. You can read my review here. What are your favorite themes for fall? Do you have any favorite books about fall, apples, or farms? Annie the Apple Farmer has wonderful illustrations. I admit that we are out of theme books though now when Anna is in first grade. 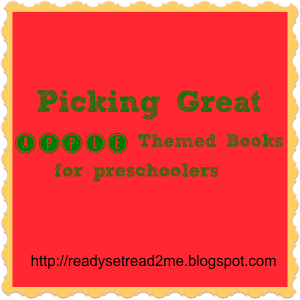 Thank you for the book list! I am your newest follower!